Real estate across Europe remains a stable, safe-haven asset class despite political, economic, demographic, technological and disruptive factors driving change and uncertainty, according to a new report released at MIPIM from Colliers International. 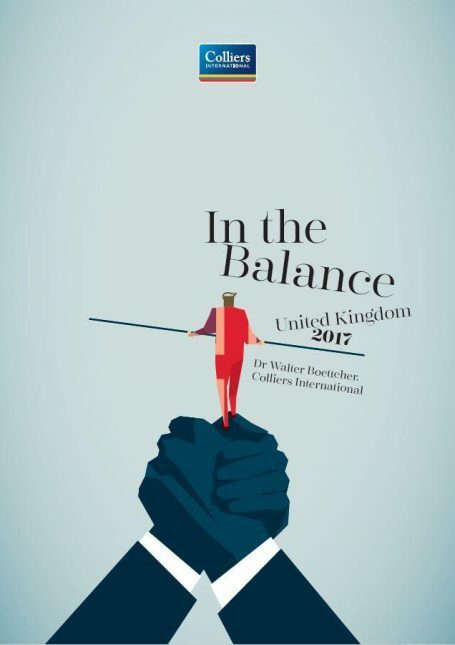 Colliers’ report ‘In the Balance: EMEA 2017’ reveals that the correlation between growth in office-based jobs and office investment turnover during the last economic and investment cycle is absolutely clear. In order to maintain this positive outlook, the priority for major European cities has to be focused on generating more high-quality, value-added office-based jobs to drive occupier and investment demand for assets. Damian Harrington, Head of EMEA Research at Colliers International, commented: “On the downside, the UK vote to leave the European Union, the rise of populist politics across Europe, and a new political regime in the US all signify the prospect of major change. Yet on the upside we continue to see economic growth in Europe, and investment capital continues to build its appetite for real estate globally – primarily driven by the continued search for yield and income. “Equally, although inflation and interest rates are on the rise, the natural level of short-term interest rates continues to be compressed by long-term demographic change and slower economic growth. A market comprising low yields is becoming the new normal. Coupled with very low levels of leverage, and a lower threshold for return expectations amongst some of the bigger global players, things don’t look so bad after all. The changes the market faces continue to provide new opportunities to invest in real estate. It’s a case of acting on those opportunities and holding on for the ride. Ongoing demographic, technological and consumer behaviour are changing the dynamics of real estate demand in different cities. Although offices and retail remain the most popular and widely accessible investment grade assets, accounting for 60 per cent and 13 per cent of investment activity in 25 of Europe’s major markets by the end of 2016, there is continued evidence that their popularity continues to diminish in favour of other asset types. Growth in residential investment in major cities is outstripping growth in other sectors, rising to over 10 per cent of city investment volumes. Investment in city logistics has remained static over this cycle, but we expect this to change in future. Structural demand drivers continue to drive appetite into the sector, but competing with other use types to generate a profitable and competitive existing-use value is requiring creative thinking and solutions in this area. Incorporation into mixed-use looks to be the most realistic option within cities, while new multi-storey warehouses are starting to emerge on the edge of major European cities. Although activity in the hotel sector looks to have been limited across the region as a whole, when the report takes a closer look at city-based investment activity, it too shows an increase in popularity. Driven by demand growth in both business and leisure travel, hotel investment has grown by around 230 basis points since 2007, and volumes in 2016 were one third up on their cyclical average. Despite competition from Airbnb, cities across Europe continue to post strong occupancy and RevPAR figures, which have steadily grown since 2012. On average, retail and offices have seen their average trading yields plateau, but are yet to reach the lows of 2007. Residential is the lowest-yielding asset type, and levels are back to where it was in 2007. Hotel trading yields have now surpassed their previous peak. In line with a decline in land sales across Europe, development land sales in Europe’s major cities has fallen from 8.13 per cent of all activity in 2007 to only 3.25 per cent at end 2016. Investors and developers will be concerned about investing and developing into the end of a maturing economic and investment cycle; and history shows they should be adopting caution. Colliers identifies that from 2015-2016, there was a 50:50 split between those cities which saw investment activity rise, versus those reporting a reduction in trading. EMEA volumes and deal activity dropped by around 27 per cent year-on-year in 2016, yet despite an overall reduction in both deal-flow and volumes, the picture was very mixed. However, 50 per cent of markets recorded positive growth in activity in 2016. The Netherlands, Spain, Ireland, Finland, the Czech Republic and Hungary all saw a positive jump in growth, with more modest expansion in Sweden, Poland and Romania. Further afield, some big jumps were witnessed in the peripheral markets of the Baltics, Greece, Ukraine and Croatia as capital continued in the search for yield.